Stall rest is not something equestrians ever want for their horse. Horses do best, physically and emotionally, when constantly moving. So the prospect of weeks or even months in a 12×12 stall is enough to cause us stress as well. The trick is keeping our horse calm during stall rest. *All opinions are my own and products which I feel will provide the best natural results for your horse. While stall rest due to injury is sometimes a necessity, it is usually because the positives outweigh the negatives. What are some complications that can occur due to stall rest? Inflammatory Airway Disease (IAD) can occur from prolonged exposure to environmental particulates dispersed from feed, bedding, or footing. This can cause inflammation and increased mucus production. The last thing we want is for our horses to get a secondary problem. Wetting the footing and soaking hay and feed is a good way to reduce dust and air particles. Colic is a word that sends shivers through us all. According to TheHorse.com, “Stall rest contributes to 54% of impaction colic cases.” Movement during turnout and exercise increase circulation and stimulates the metabolism. When unable to move the possibility of colic increases. Being kept stall bound, you may find yourself with an increasingly frustrated horse. As herd animals, they do not do well in isolation and with limited movement. Pacing, stomping, and vocalizations are all the opposite of what we want for our horses on stall rest. All the exercise they were used to is now taken away and they are a pent up ball of energy with nowhere to put it. 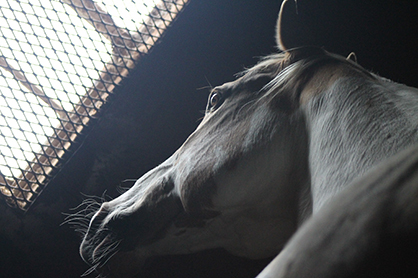 There are a number of ways to keep your horse calm during stall rest. These options are not in particular order of priority or importance. In fact, they may be used together for the best possible results. Aromatherapy has been a proven, natural remedy for thousands of years. In fact, many current chemical medications are derived from plants. In the wild, horses choose the plants based on their need, typically referred to zoopharmacognosy. Horses are extremely sensitive to essential oils and respond very well, either by inhaling deeply, licking the essential oil, or having it applied to their skin with a carrier oil. The beauty of essential oils is they are easily absorbed into the body, going directly to neural pathways within minutes of application. I find that most horses prefer our Serenity Spray, which I initially used as a massage blend. Before massage with anxious horses, I apply it to my hands and give them a chance to inhale for a few minutes. It smells lovely, and is also perfectly blended to use topically on the skin. For several months I was working with a high-anxiety therapy horse. Outwardly calm when under saddle with his special needs riders, he would hold his tension internally. This resulted in a very anxious horse while not working. It took months for me to build trust with him during massage. One day he was exceptionally head shy. Usually this notes a lot of tension in the poll, and I do not force my equine friends. Instead, I enticed him with my Serenity Spray. Even I was amazed at the results. Within a minute, his head was down, eyes half closed, and completely relaxed. Since then, I always start his massage with this blend and it’s done wonders for our relationship. For more information, you can read my post Building Trust in an Anxious Horse. Other popular essential oils to naturally calm horses are: lavender, vanilla, ylang ylang, geranium, clary sage, vetiver, and frankincense. If possible, it is always best to give your horse a choice, and often a blend may be needed. For more information please visit the Beginner’s Guide to Using Essential Oils. Many of us know the relaxing benefits of massage on our own bodies. It stands to reason it would have the same effect on our equine friends. The purpose of massage is to relax the muscle tissue, increase blood flow and oxygen flow, and decrease pain. The increase of circulation reduces lymph and swelling, and also speeds healing. But did you ever question why massage is relaxing? A wonderful side effect is that massage also releases endorphins and increases cortisol levels resulting in feelings of calm and happiness. A few years ago, one of our clients was seriously ill from an abscess in his jaw. He was on stall rest for more than 2 months after almost losing his life and had lost approximately 40-50 pounds of muscle. His little girl was seriously worried about him and he’d lost his spark. He is a very easy going boy, but was used to living outside in a herd. Stalls were not usual for him. I had the pleasure to massage Mac. My goal to reduce tension, provide pain relief, and allow him to recover more quickly and get him back outside playing with his friends. The first massage he melted into the wall and gave some amazing stretches. I followed up with him three days later, lunging* him afterward as a favor to his owner (who also happens to be a friend of mine). Mac was a spark of energy in the round pen, bucking and kicking his way around. He’d definitely found his spark! A few hours later, he went lightly under saddle for a little walk/ trot and one of the barn girls snapped an amazing photo. The nice thing about massage is there is no down time required afterward. Light exercise helps the horse to continue tension release and stretch after massage. Massage has been proven to spike cortisol levels for up to 48 hours. This coupled with the ability to speed metabolism and blood flow is why we recommend a horse on stall rest receive massage 1-2 times weekly for the best results. Massage therapy is a medically-based and non-invasive way to reduce harmful levels of stress hormones in the body and speed rehabilitation time. It is not miracle work, it’s science. And oh so beneficial. Reiki is a Japanese healing technique based on the principle that the therapist can channel energy into the patient to activate their natural healing processes and restore physical and emotional well-being. Mind-body-soul healing from the inside out using the energy of the universe. This healing technique is becoming increasingly popular as part of a holistic wellness program. I was skeptical myself at first until I saw (and felt) it with my own eyes. Sensitive animals such as horses are exceptionally receptive to this technique, and can create much calm and tranquility. Acupuncture is the technique of inserting fine needles into certain identified acupuncture points or “meridians” that run throughout the body and correspond to certain organs. The premise is that Qi, or energy, runs through bodies along these meridians and that our emotional, physical, and mental issues may be caused by blockages to this Qi. Working side by side an equine acupuncturist at Bridle & Bone Wellness, I see how well horses respond to treatment. Dr. Michelle Morges provides an initial evaluation, similar to the one we do with massage, and then will use a small number of needles in the important areas to improve circulation and reduce tension. Increasingly, equine veterinarians seeing the benefits and are performing acupuncture or recommending it as part of a complete wellness program. None of us can deny the importance of diet and nutrition for our horses. The multiple google searches will attest to that. There are a few calming supplements on the market today that you may find helpful for your horse. Serenity Spray by Bridle & Bone Wellness. Our customized blend of essential oils and carrier oils designed specifically to promote calm and reduce anxiety naturally. PCR Oil by Treatibles. These high potency dropper bottles contain non-psychoactive phytocannabinoid-rich (PCR) oil extracted from medicinal grade hemp grown in the USA. PCR oil has been shown to naturally bring your horse back to neutral. The beauty is that it is THC-free, works quickly, and can be given orally directly through the mouth or in grain or water. Smartship & Show Paste. According to the distributor: SmartShip & Show Paste can help him cope with the demands of trailering, competing and other stresses. This comprehensive formula provides: Probiotics and prebiotics to support healthy digestive and GI tract function; Electrolytes to replace minerals lost in sweat and to encourage proper hydration; The potent antioxidant vitamin C, which protects cells throughout the body from the damaging effects of stress. Smartcalm Pellets by SmartPak. SmartCalm Ultra Pellets are an herb-free formula designed to support proper nervous system function, helping to minimize skittishness. They offer a comprehensive approach to calming by providing 10,000 mg of magnesium, 1,000 mg of vitamin B1, 2,000 mg of inositol (a B vitamin relative), and 500 mg of L-tryptophan. This essential amino acid is converted into serotonin, a hormone that may increase feelings of well-being and contentment, helping to calm and soothe. Herbsmith Serenity. This blend is used to calm irritability and apprehension. It is ideal for the horse who is easily frustrated when asked to perform tasks, easily frightened, often shy, difficult to control due to excessive excitement and too preoccupied with the scary things in life to perform to their fullest potential. There are no tranquilizers in the combination, but rather herbs that naturally calm to take the “unproductive edge off” without losing the horse’s natural athletic ability. Who has a horse that loves to play? In the field horses play with each other. Stall rest means no interaction with their friends, and frankly- boredom. A bored horse is a frustrated horse, and one that starts bad habits like cribbing or kicking the walls. Here are some suggestions for stall toys and puzzles. Haynet filled with hay, apples, and carrots. A perfect scavenger hunt for goodies will be sure to keep your horse busy. Make sure to cut the apples and carrots so they are small enough not to cause choke. Horseman’s Pride Stall Snack with Jolly Ball. I confess I bought this for Delight as a Christmas gift. What a great way to stimulate playtime in the stall. Easily hang, it is apple-flavored and perfect to keep your horse busy. Safety mirror. Acrylic and safe for inside the stall this provides a horse with a “friend” even when cooped up. Salt Lick. Important nutrients for horses and stimulates drinking of water, which in turn promotes healing and metabolism. DIY Stall Toys. You know your horse best. Think of some fun ways to keep your horse busy while providing a personal touch! I know that it can be frustrating and worrying to have your horse on stall rest, even for a short time. But as you can see there are many ways to help relieve your horse’s boredom and passively speed healing without them having to be turned out in a paddock. Using a variety of these methods outlined above will be sure to relieve boredom and provide your horse what he or she needs while stall bound. Heather Wallace is the writer and photographer for the blog, Bridle & Bone, which focuses on horses, dogs, and holistic wellness. In less than a year Bridle & Bone was awarded Top 100 Equestrian Blog by Feedspot, the Blogger Recognition Award, and was been nominated for the 2017 Haynet Equestrian Blogger of the Year. Heather is a certified equine and canine sports massage therapist and co-owner of New Jersey-based small business, Bridle & Bone Wellness. For more information, please visit her at www.bridleandbone.com.